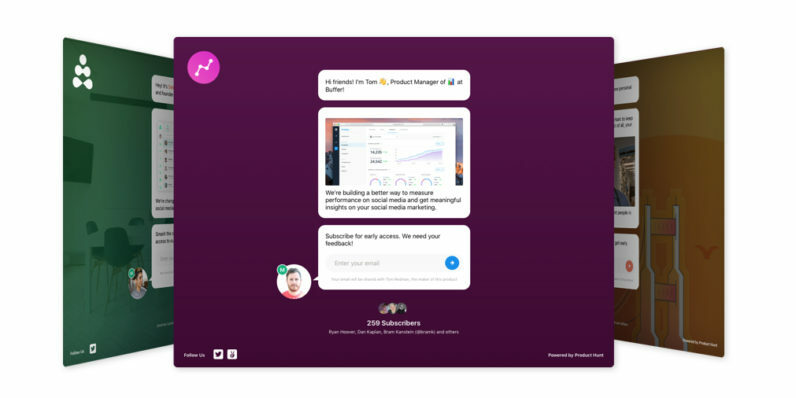 Product Hunt has made a name for itself as one of the best places to launch and discover new products and services over the past couple of years. Now, it’s branching out with a bunch of tools to assist entrepreneurs and makers before they go live. The new Ship suite of tools is focused on helping you spread the word about your upcoming product and building a list of prospective customers’ contacts. Product Hunt founder Ryan Hoover has previously written and spoken about the importance of building an audience before launching your product; that’s certainly worked for him, and Ship will hopefully help others gain traction early too. Ship includes a web-based tool to create a ‘Coming Soon’ landing page along with a form to collect interested users’ email addresses. It only takes a couple of minutes to set up with custom messages, branding and background imagery. You can also create a widget with similar messaging, and embed that on your existing or new site. As with the landing page, it comes with the all-important email subscription feature. All the addresses you collect can be exported in case you want to use your own email service. Lastly, there’s a simple way to reach your email subscribers right from within PH. You can hit them all up at once to request feedback, announce new features and promote special offers. You can get started with Ship at no charge; the free plan gets you on the waitlist to try the service, and nets you one landing page, a single email message per week, as well as the embeddable widget. Paid plans add functionality like group messaging, surveys, scheduled product launches and a custom domain; these are available at $59 and $199 a month, depending on the mix of features you need. That should take some of the stress out of launching a product for first-timers, though folks who’ve been to this rodeo before might be more comfortable with custom tools. Get started with Ship by signing up over at Product Hunt; that link will snag you a 20 percent discount on the Pro and Super Pro plans until the end of September.